Julienne the fresh raw carrots that are peeled. They are then cooked in oil and whole spices and finished with sesame seeds. 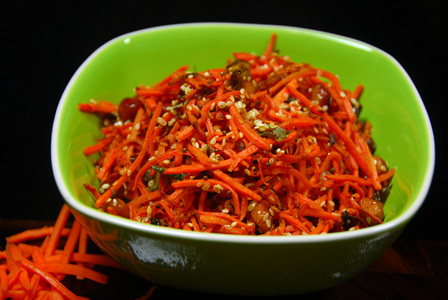 Serve julienne carrot fry with steamed rice and dollop of ghee. Makes: around 4 Servings of Julienne Carrot Fry. Peel, remove ends and wash the carrots. Julienne the carrots using a knife or a julienne cutter. Heat oil in a pan, add peanuts. Fry till peanuts are golden in color. Then add all talimpu ingredients in order. When mustard seeds start spluttering, add green chiles and carrots. Cook covered on low flame for around 5 minute or until carrots are cooked. Stir in sesame seeds and salt. Fry briefly, remove from heat, stir in red chili powder. 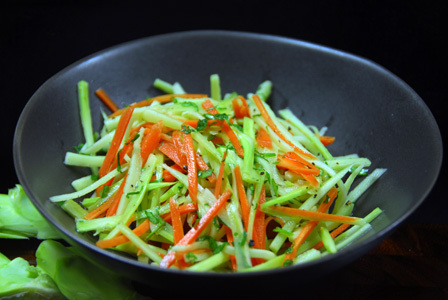 Serve julienne carrot fry with steamed rice and dollop of ghee. Notes: Make sure carrots are cooked well. Suggestions: Adjust spice with green chiles or red chili powder. If carrots are not cooked well, put it back on heat and cook covered till done. Variations: Check other recipes with carrot here. Other Names: Julienne Carrot Fry. Makes: around 1 Cup of Spicy Carrot Chutney. Break tamarind into small pieces. Heat a tsp of oil in a pan, add chana dal. Fry till chana dal turns light golden in color, and remove onto a bowl. In remaining oil, add the green chiles. Fry for few seconds, add carrots and salt. Cook covered until carrots turn soft. Grind chana dal into powder using a spice grinder. 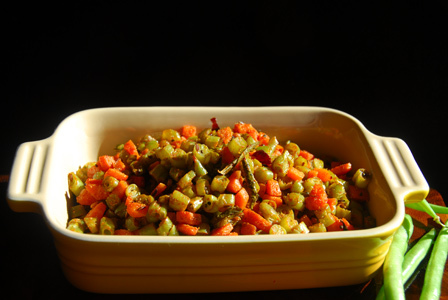 Stir in the carrots along with green chiles and tamarind and grind again into smooth paste. Remove the carrot chutney onto a bowl. Heat tsp oil in a pan, add all talimpu ingredients in order. 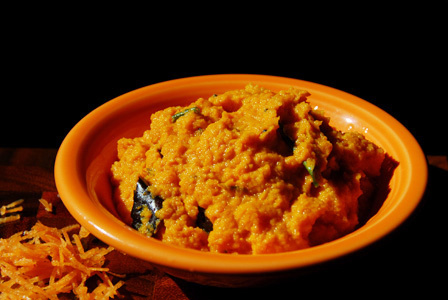 When chana dal changes color, remove from heat and add to the carrot chutney. Mix well and serve spicy carrot chutney with steamed rice or with idly, dosa etc..
Notes: Make sure carrots are not overcooked. Suggestions: Adjust the amount of green chiles for spice and tamarind for sourness depending on the sweetness of the carrots. Variations: Alternatively, pressure cook or steam the whole carrots and then grind them along with fried green chiles and tamarind. Other Names: Carrot Pachadi, Gajar Chutney, Spicy Carrot Chutney. Spinach is finely chopped and cooked in oil till soft. Carrot is finely grated and added to the raita along with spinach. 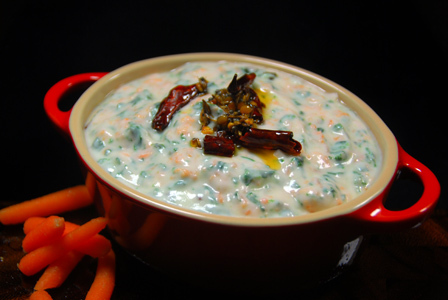 Raita is finished with talimpu and serve carrot spinach raita with steamed rice or with roti. Makes: around 4 Servings of Carrot Spinach Raita. Wash, remove ends, peel and finely grate the carrot. Whisk yogurt and salt thoroughly in a mixing bowl. Heat a tsp oil in a pan, add spinach and cook till it wilts. Remove from heat and add to the yogurt bowl. Heat a tsp of oil in the same pan, add all talimpu ingredients in order. When mustard seed start spluttering, remove from heat and add to the above raita. Mix well and serve carrot spinach raita with steamed rice or with roti. Notes: Make sure spinach is cooked well. Suggestions: Adjust spice with red chillies or use green chiles and fry them along with spinach. Variations: Add a pinch of sugar to the raita if you wish. Other Names: Carrot Spinach Raita.